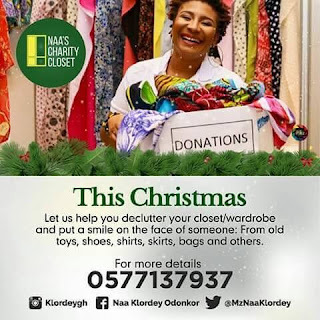 Touted as the queen of mid morning radio, sensational and celebrated radio personality Mz Naa Klordey Aba Yaa Odonkor affectionately called Mz Naa by her fans and listeners has announced her intentions to give back to society by way of decluttering closets for items that will be of great help to the less privileged and marginalized in the society. Making the announcement on her facebook page on 22-11-17, Mz Naa expressed how she loves her job and the impact it makes in the lives of people. She commended a few people who have supported her through her journey in radio and added that her charity project for the year will be unveiled soon. “I love my job and I am fully convinced my job loves me too. Shouts to Hammer Nti my boss, Abraham Alokore my best friend and closest buddy (Smart and intelligent man I love to listen to and spend time with). Lol! Jackson Robert (DJ Rajj ) working with you is so much fun for me. A day without you is no day (sounds like what I day to Jesus always) Nana Obiri-yeboah my wagadri friend yet my P.I.C the love is still deep. “Get ready, I am going to help you declutter your closet. Food, drinks, toys, clothes, learning materials are welcome. Mz Naa is on air every week day on ultimate radio 106.9fm from 10 till midday.